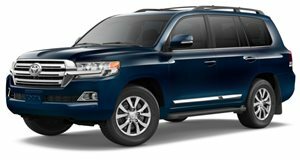 The Land Cruiser is an SUV with a mountain of capability, but before delving into that, I must warn readers of two things that alter my bias. The first is that on orders from Toyota, we were not able to take the Land Cruiser, a vehicle that’s name alludes to its rock-masticating prowess, off of the pavement. Second, and most importantly, is the fact that I have an extensive history with the car, having done plenty of miles behind the wheel of the SUV in my second home country of Costa Rica. I even blew the 4.2-liter inline-six engine on my grandmother’s J100 Land Cruiser. In total, my Costa Rican relatives own over ten Land Cruisers and many of the memories I have of the country involve my family touring in a Land Cruiser convoy with luggage compartments, roof racks, and all eight occupied seats bulging. In the Cruisers, we fought street vendors and suicidal taxis in the city, munched miles of dangerous highway, and weren’t intimidated when the road ended. At times our Land Cruisers would be scaling seemingly impossible routes where one improper throttle application would mean tumbling down a steep cliff all the while the interior atmosphere consisted of stories and jokes as if the dangerous outside world was no bother. 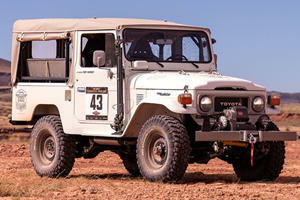 Suffice it to say, the way I view the Land Cruiser, I may as well have been born inside of one. 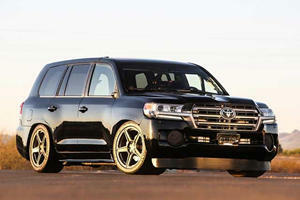 You can imagine my excitement when Toyota delivered the newly refreshed Land Cruiser to my door for a week of vetting. The SUV is one of the most incognito cult cars out there. If you have to ask about the club, well, refer to rules one and two of Fight Club. Toyota understands its legend and only allows its most experienced workers to construct the car. After all, only loyalists would drop $84,820 on a Toyota. Aside from the new “look at me!” grille, I felt right at home. In fact, driver aids aside, the only differences I spotted were an infotainment system, two HDMI-ready TV screens mounted behind the front seats, and an interior that was upgraded to feel luxurious. This new iteration comes supplied with a Kinetic Dynamic Suspension System that is intended to make the utile mass tolerable on pavement. Make no mistake though, this is still a 5,800-pound SUV, so when it’s placed onto the cramped and aggressive streets of San Francisco, the Land Cruiser becomes a burden. It’s not the 5.7-liter V8 that’s to blame, it’s the eight-speed transmission. Dropping gears to pass a car took a lifetime and the indecisive slush box felt as if it had a hard time juggling the car’s weight, the 381 horsepower and 401 lb-ft of torque output, and driver commands. The result was an average fuel economy of 8 mpg, which steeply contrasted to the EPA estimated 13-mpg city (18 highway and 15 combined). Gearbox aside, my example provided me with the balance of functional driver engagement and ergonomically placed utility that inspires the confidence I had become accustomed to in the Land Cruiser. Driver aids were plenty and I found the heated and ventilated seats, blind spot monitoring, rear cross traffic alert, and radar-based cruise control helpful in the city and on the highway. A 360-degree camera enabled surgical precision when parking and I imagine that they would provide the same assistance off road. Speaking of the gravel, this SUV came loaded with off-road tools. Toyota’s crawl control was present here as were a battalion of features like a locking limited-slip differential, multi terrain select, hill-start assist, and off-road turn assist. Unfortunately, the four-wheel drive selector never made it into the low-range setting. Given the mild demands of my urban millennial life, I estimate that I used no more than 10% of the Land Cruiser’s capability. Unfortunately, as a tech savvy millennial, I found Toyota’s infotainment system a chore to use on trips and a downright danger in claustrophobic traffic. The delayed responses of the system found in all Toyotas are inexcusable in an age where we have the computing power to order food, chauffeurs, and hot dates to our door using a competent 4.7-inch iPhone. At least the sound system made up for the 9-inches of center screen mess because the 14 speaker JLB audio system is one of the best-sounding systems I’ve heard in a car. Whether cruising comfortably with my brain waves static or doing battle with rush hour traffic, I kept comparing my experience to my Costa Rican Land Cruiser fantasy. I concluded that this is more car then the vast majority of the population will ever need. It’s main competitors come in two classes and none can pull off exactly what the Land Cruiser does. One side contains off-road shy luxury SUVs optimized for the city like the Cadillac Escalade, Lincoln Navigator, and Infiniti QX80. On the other hand are the mud warriors like the Mercedes G Wagon and Range Rover, which are great off road but won’t match the cargo capabilities of the Land Cruiser. This may be why the Land Cruiser has such a cult appeal. In the end, it's a very well refined Swiss Army Knife with a range of capabilities that means it won't be manhandled by the circumstances of life. Instead, it adapts to the situation. There are few who will ever need the Land Cruiser's full barrage of capabilities. The times I've spend traversing wet and imperfect jungle terrain using every inch of cargo space while my family sat in comfort are the few instances where the Land Cruiser really comes alive. Despite its imperfections, the sheer level of utility makes the Cruiser worth the money. Badge snobs aren’t the target here, just those who want to cruise by unnoticed, absorbed in their own world of comfort and convenience, and with full knowledge that any obstacles will be dealt with. 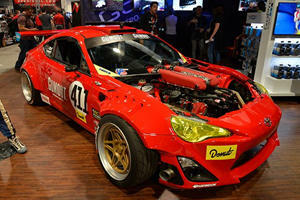 SEMA always has the coolest stuff.